When you arrive home after a hard day at work, one of the last things you want to be dealing with is a garage door that’s fixed shut. Often times, broken springs are the culprit - a situation that warrants professional repair or replacement. But why exactly do springs give way in the first place? Here are our top four reasons - read on to learn more! Despite our best efforts to stay young and fit, we can never outrun mother time. The same applies to your garage door springs. 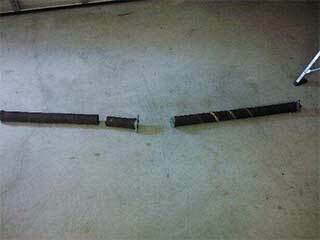 Every time you open and close your garage, the overhead door springs undergo wear and tear. Even if you do everything right with regards to maintenance, every mechanical part will fail if given enough time. If you have a large family that’s always in and out of the garage, those repetitions will add up, eventually causing the springs to give way. Rust is another common culprit when it comes to broken extension door springs. Not only does the buildup of rust in the coil increase friction, the rust itself is corrosive, which can weaken the spring material. You can minimize rust buildup by applying a lubricant to the springs a few times a year, and wiping away any residue. Cold weather causes the steel in the door springs to contract and stiffen. Just like a muscle that hasn’t been warmed up properly before a workout, if the spring is suddenly called into action by someone opening the door, this can cause it to falter and snap. Unfortunately, you’re unable to control the weather. But you can reduce the risk of a sudden break by opening the door slowly after a cold night. Each garage door is designed to be used with springs that have specific lengths, widths and elastic range. If you put the garage door together yourself (or used a third-rate contractor), your door may well be fitted with faulty springs that may not last as long as correct ones. If you’re interested in having one of our experienced professionals assess your existing springs to make sure they’re the right fit for your door, contact our team today at Garage Door Repair Darien for more information.